Sometimes in life you encounter someone who knows much much more than you do about a certain topics. This happens to me pretty often (especially when it comes to the sciences!) thanks to the wonderful world of social networking that brings me into contact with interesting people. That’s how I met Mauro Di Vito, a PhD candidate in the history of Science at the University of Pisa. Mauro is an expert on the Baptistry doors – I found this out thanks to the range of fascinating detail photos he posted of it on facebook! So I asked him to tell us some interesting facts about those doors. But before we get to the seven facts that he's written for us, let’s review some basics. The South door (with its doors by Andrea Pisano made in 1330) is actually the Baptistry’s main door and it should be considered the most important because it’s the oldest. Furthermore, as it’s south-facing, it was the door through which Florentine godfathers used to enter holding the precious newborn. 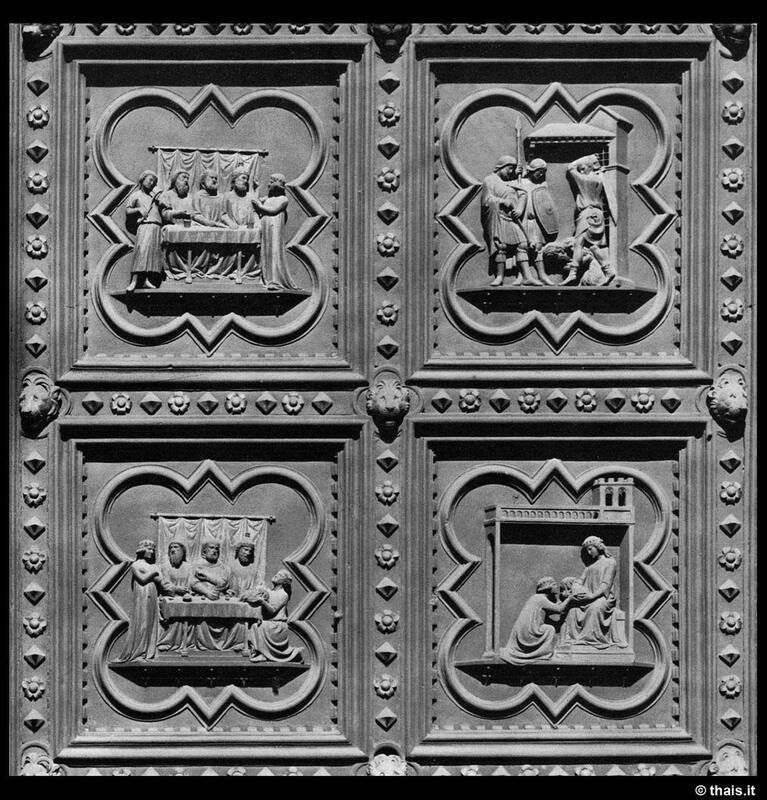 Lorenzo Ghiberti, when he was commissioned almost a decade later to do a second set of doors for this building, paid homage to Pisano’s doors by creating its important frame (it was designed by him and executed by studio assistants who went on to become the most important sculptors of the second half of the Quattrocento: Pollaiolo, Rossellino, and Verrocchio). In his Lives of the Artists, the art historian Giorgio Vasari claims that the South doors by Pisano were originally placed across from the Cathedral (i.e. the East doors where Ghiberti’s Gates of Paradise now stand). 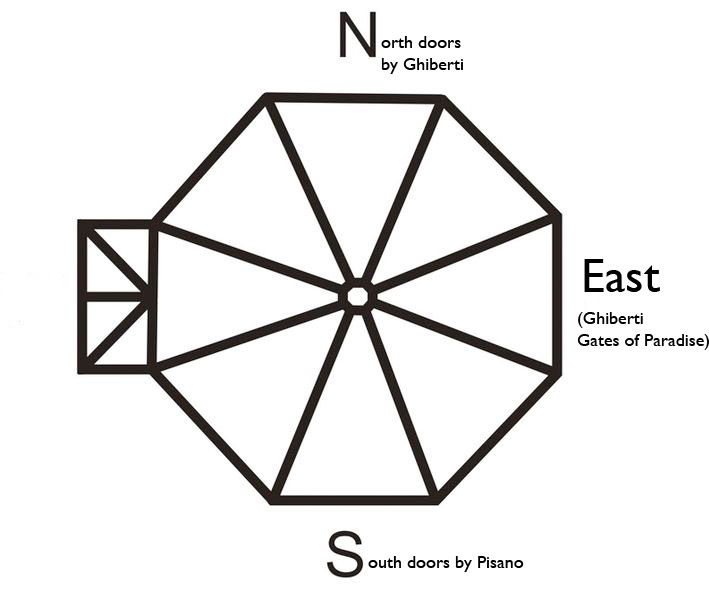 This cannot be true: Pisano’s doors are just slightly taller than the East doors by Ghiberti and they wouldn’t fit in the door frame! Vasari probably writes this white lie to add importance to the Gates of Paradise, in part for political reasons: the frame of the South door alludes to the Florentine Republic, which Vasari prefers to avoid since he is writing while on the Medici’s payroll. The commission for the North doors was awarded to Ghiberti through a public “contest” in which the runner-up was Brunelleschi. Both were asked to depict the scene of the Sacrifice of Isaac (the originals are now on display in the Bargello Museum). Ghiberti’s relief weighed less, and thus cost less. Aldo Galli suggests that this economic factor played a part in Ghiberti’s win. 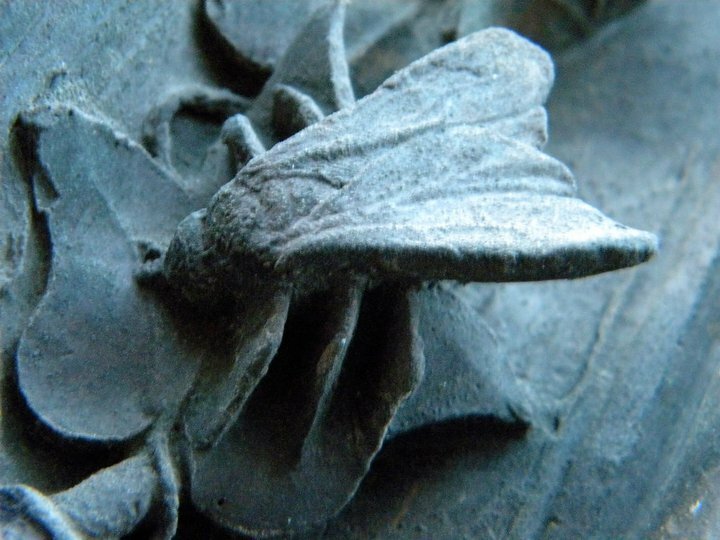 On Ghiberti’s first set of doors, between the quattrofoils there are plant and animal decorations. Of these we note insects and animals known for their harmful characteristics. 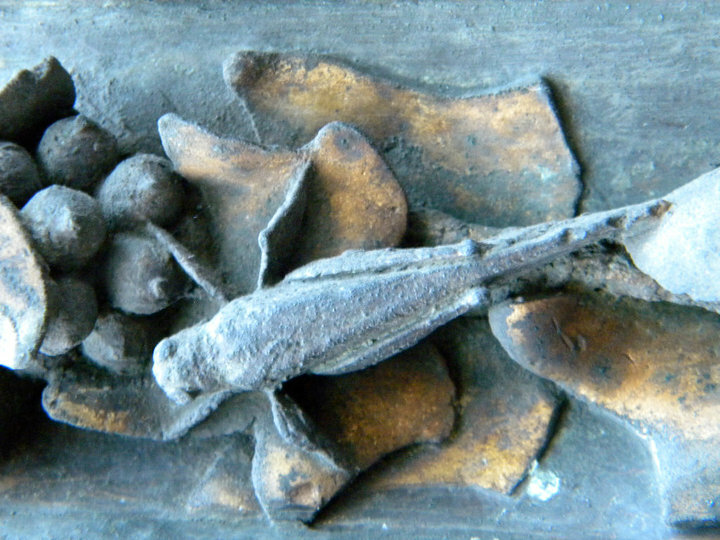 The life-size carpenter ants, beetles and locusts were in some cases cast from the real things using a technique described by Cennino Cennini. By medieval logic, representing these evil things was a manner of keeping them away – the doors thus gained amuletic quality. [article] On the frames of the east and north doors there are garlands of flowers and fruits inhabited by reptiles and mammals. The amuletic quality of the insects applies here too to ward off animals that could harm harvests. As you know, Ghiberti was commissioned for a second set of doors (the Gates of Paradise) after completing the earlier ones (the quatrefoil ones with the scenes from the life of the Evangelist) that were initially intended for the East door. 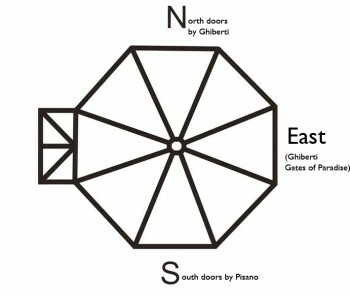 Ghiberti had made the frame for the east door. The newer doors were installed there and he had to hurriedly create a frame for the north opening that welcomed his earlier creation. If you look closely you can see this hurry reflected in the errors of fusion that the bronzeworkers made.